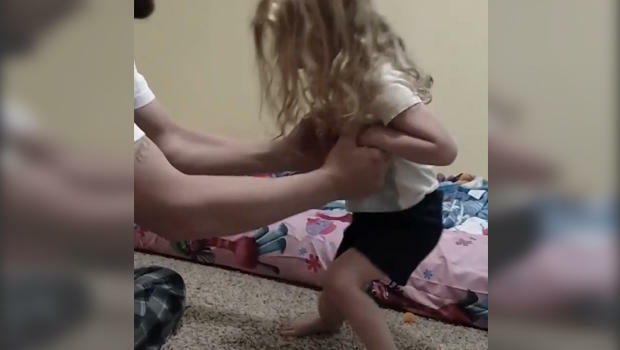 One Oregon couple's video of their young daughter suddenly experiencing paralysis has gone viral after the child's mother posted the frightening moments on Facebook. In a Facebook post, Amanda Lewis described how her 3-year-old daughter, Evelyn, became fussy after a bath on May 13 and didn't want to stand up. "Evelyn started acting a little weird last night around bedtime. She didn't want to stand up after her bath to get into her pajamas. I helped her and got her in bed. She was a little fussy last night and I ended up sleeping in bed with her all night," Lewis wrote. The next morning, the little girl was still having a hard time standing. "She could barely walk, or crawl, and could hardly use her arms," Lewis added. "We decided to take her into the ER right after we took this video because her symptoms were getting worse," Lewis wrote. A doctor there discovered a tick in Evelyn's hair, explaining that some tick-borne diseases caused paralysis. "The doctor talked to us for a minute and said over the past 15 years he had seen about seven or eight children her age with identical symptoms and more than likely she had a tick. They looked her over, combed through her hair really well and sure enough found a tick hiding in her hair," said Lewis. "I'm glad we took her in when we did," Lewis wrote. She warned other parents: "The ticks are out like crazy right now in this area so if your children or dogs start acting a little off, check them thoroughly for ticks! I feel awful for not having seen the little bugger sooner but I never would have even thought to look for a tick." The tick was removed during the emergency room visit and Evelyn stayed on for observation for a while, afterwards eating a popsicle and watching cartoons, her mom reported. Lewis returned to Facebook to share an update on Evelyn's condition, saying she's much improved. "Evelyn is doing much better. It took her until the next morning to start acting like herself again. She is now pretty much completely back to her feisty little self," Lewis wrote. According to the U.S. Centers for Disease Control and Prevention, tick paralysis is a rare illness that experts say may be caused by a toxin in a tick's saliva. The symptoms include acute paralysis that is often confused with other neurological conditions, including Guillain-Barré syndrome or botulism. Within 24 hours of removing the tick, the paralysis usually subsides. Of course, tick paralysis isn't the only tick-borne illnesses out there. Tick season is upon us and experts say this could be a "particularly bad year," as they're seeing greater numbers of ticks in more areas of the country. Lyme disease cases have been on the rise, Rocky Mountain spotted fever is common, and Powassan virus, though rare, can be fatal. So far, Amanda Lewis' video has been viewed more than 21 million times and shared by thousands of people. "My husband and I are still in shock that this happened to our baby girl and I'm glad we were able to spread some awareness about this," she wrote.